Official Site: Domaine -- Homepage on the author's website. Each duke seeks to establish a claim over the most valuable parts of the kingdom before the king finally returns. In the dark of the Middle Ages, control of the land was the key to wealth and power. Can you control enough territory to become the most prestigious duke before the king's return? In Domaine, players form domaines by placing walls on the modular board to enclose territory. 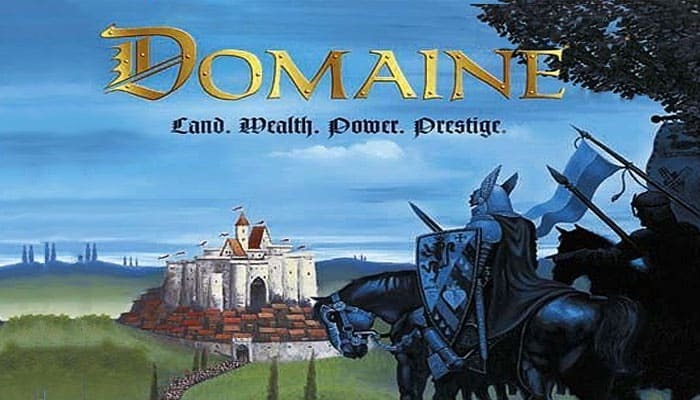 Completed domaines can then be expanded, even into your opponents'. 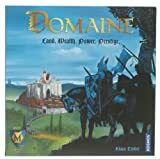 Protect domaines by placing knights, which resist expansion. Actions are taken by playing cards that have a cost associated with them. Gain money by selling cards and controlling mines. Sold cards can be acquired by other players. Players score points based on the quantity and type of terrain enclosed in their domaines, as well as by controlling many mines of a single type. The winner is the first player to cross a specific point threshold or the player with the most points when the card deck runs out.